McCrae Dowless' attorney told the elections board he won't testify without a legal protection against prosecution for events he describes. The board refused. RALEIGH, N.C. -- The political operative behind what North Carolina's elections director describes as an illegal ballot-harvesting operation favoring a Republican congressional candidate won't testify about his actions without legal immunity. Leslie McCrae Dowless appeared before the state elections board Tuesday, which is holding a hearing about what happened in last year's 9th congressional district race. Dowless is accused of using illegal methods to boost the number of mail-in ballots going to Republican Mark Harris. Harris holds a slim lead over Democrat Dan McCready in the country's last undecided congressional election. Dowless' attorney told the elections board he won't testify without a legal protection against prosecution for events he describes. The board refused. The race wasn't certified, but the elections board is expected to either declare a winner or order a new election after the hearing. North Carolina State Board of Elections investigators presented evidence Monday to the State Board of Elections, showing that the company Harris hired to help with his political campaign ultimately paid McCrae Dowless to illegally collect absentee ballots in a "coordinated" and "unlawful" scheme in Bladen and Robeson counties. On Monday, investigators kicked off a multi-day Board of Elections hearing by laying out evidence gathered during a two-month long investigation. That investigation included 42 voter interviews, 30 subject witnesses, and subpoenas of documents. The scheme involved a firm called Red Dome. That firm, which was hired by Mark Harris' campaign, paid McCrae Dowless more than $130,000 between July 2018 and the November 2018 election. 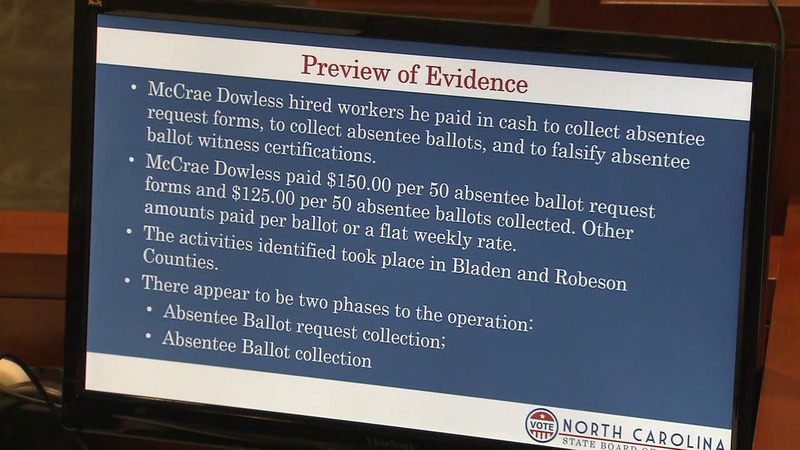 According to investigators, Dowless paid workers cash to collect absentee request forms, to falsify absentee ballot witness certifications, and to collect absentee ballots. Dowless paid his workers $150 for every 50 absentee ballot request forms they collected and $125 for every 50 absentee ballots they collected. The first witness, Lisa Britt, said she worked for Dowless. She testified that she lied during television interviews and witness statements in order to protect Dowless. Britt testified for nearly two hours. She testified that she voted illegally in 2018. She also explained how she mailed in absentee ballots without raising red flags that they were illegal. Toward the end of her testimony, she said she felt that Mark Harris was the "one innocent person" in the whole scheme. She testified that she did not believe he knew anything about the election fraud happening in the 9th District. The Board of Elections hearing is expected to last several days. The evidence is being presented to a newly appointed Board of Elections. The previous board voted 7-2 against certifying Republican Mark Harris' 905-vote win over Democrat Dan McCready because of those allegations.